Congratulations on your decision to get married in the Catholic Church. The marriage preparation process is designed to guide, engaged couples towards a sacramental marriage celebration and provide essential tools to live out this lifelong covenant. The process may take from six months to a year and begins by requesting a meeting with our Family Life Coordinator, Nereida Pagan at 407-344-9607. Below are the steps you can expect to follow. A. Preliminary Interview:The first step is a meeting with the parish priest or pastoral minister to begin the wedding planning and preparation for married life. This should take place between six to twelve months prior the anticipated wedding date and before any arrangements are made or a wedding date is set. During this interview, the pastoral minister will provide an explanation of the Pastoral Guidelines for Marriage Preparation. B. Assessment for Determining Readiness: The pastoral minister will use a variety of methods to assist in determining the maturity of the couple and their readiness for marriage. A premarital inventory (FOCCUS or Fully Engaged) will be administered and diocesan forms will be completed. C. Setting the Date: The final date for the wedding is not to be set until the entire assessment process (A & B) has been completed and a decision to proceed has been made. 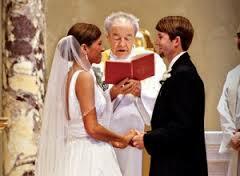 E. Wedding Liturgy: The couple will plan their wedding liturgy with the priest. Areas for liturgical planning include the selection of the scriptures, music, liturgical ministries and other related issues. Saying I Do: What Happens at a Catholic Wedding?